Moisture infiltration can cause serious damage within a structure. When water in liquid form is present, the impact can be catastrophic—the structure can become uninhabitable. There are various methods used to address water penetration within a structure, and two of the most common techniques are waterproofing and dampproofing. Both these options can prevent moisture, but waterproofing will resist the passage of water under hydrostatic head pressure. In other words, it stops liquid water penetration when the water is in contact with the waterproofing material. In comparison, dampproofing only resists water in the absence of this hydrostatic pressure. To effectively protect against liquid water intrusion, waterproofing therefore constitutes an essential component in a structure’s long-term durability and performance, representing a key element in design and construction. Several waterproofing products and systems are available in the marketplace, but it is a case of ‘specifier beware:’ there is no single system that will work for every situation. The critical issue in evaluating and specifying materials for any potential application is knowing all systems and technologies come with strengths and limitations. As with any project, the role of the participants in the design and construction team is critical for waterproofing success; when considering such technologies for long-term performance, the team approach is a must. During design, the architect needs to consult the manufacturer to ensure the correct material is being selected and is being properly incorporated. During construction, it is essential the installer be fully trained in the application of the system, and is able to communicate any concerns that may arise during installation. Finally, on completion, inspection of the system can provide a level of assurance the waterproofing has been installed correctly and any potential issues have been addressed. There are numerous critical factors that must be considered during the selection process of a waterproofing system; all of them should be addressed to ensure the correct system selected will perform for the environment in which it is being installed. Local building codes set mandatory requirements for the structural safety of buildings and the designer needs to ensure the material is meeting or exceeding these requirements. The building codes typically provide the minimum requirements; a number of these waterproofing systems far exceed what is required. 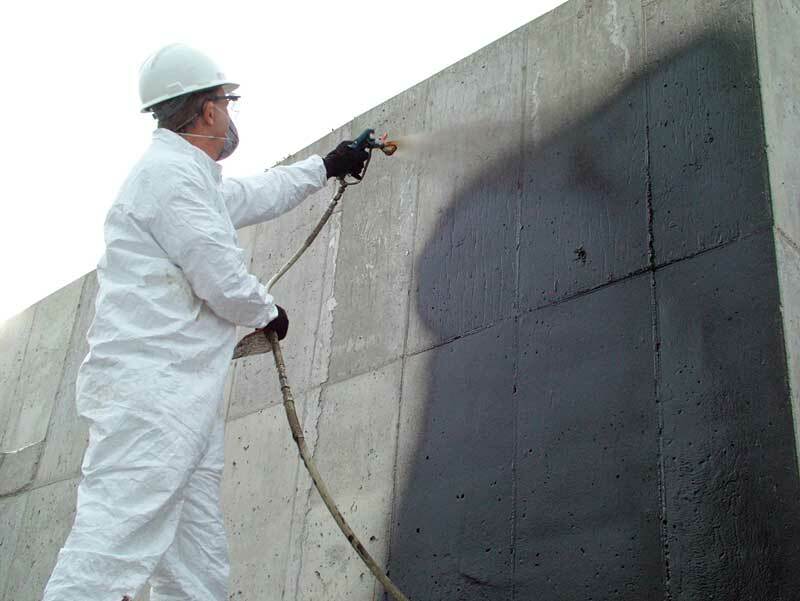 This fluid-applied membrane is ideal for providing a monolithic waterproofing membrane. Chemical and physical properties of the soil can affect a waterproofing system’s long-term durability. 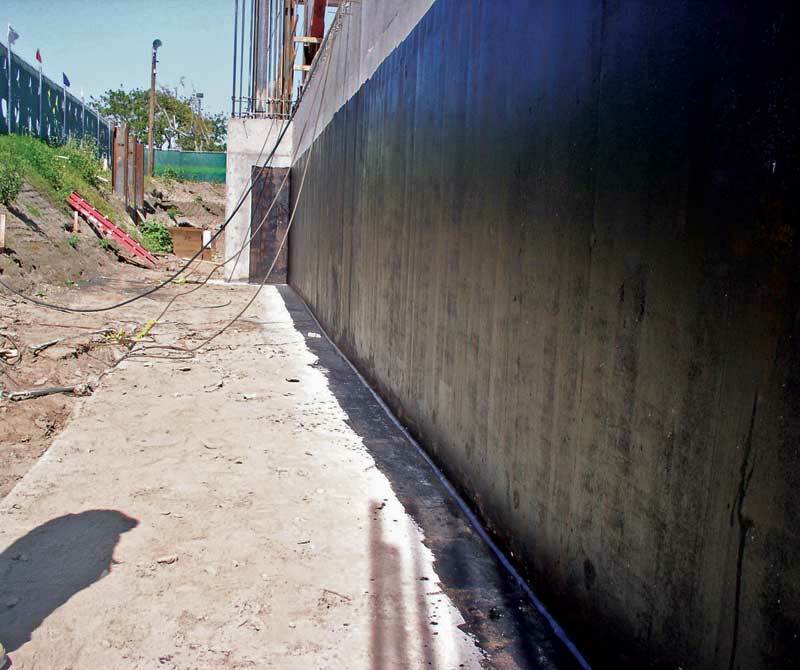 For example, use of a negative-side (described later in this article) waterproofing membrane in an area with high soil pH can result in deterioration of the concrete and the reinforcement within the concrete. Also, when using a positive-side system (described later), it is important soil contaminants are not highly corrosive or able to damage or degrade the waterproofing system. An example here would be the use of rubberized asphalt membranes in an area contaminated with petroleum products. When considering a system, it is critical to review the foundation and concrete slabs, along with the types of soils surrounding the structure. In areas where there is the potential for cracking of the substrate, it is often desirable to specify a flexible system with self-sealing characteristics. Is it going to be an application requiring a pre-applied waterproofing system, or can a conventional system be applied to the poured structure instead? Does the waterproofing system require a completely dry surface or can it be applied on a damp substrate? Is the material resistant to colder temperatures during and after application? How easy is the system to install? When considering waterproofing methods, it is important to look at both the material being considered and the manufacturer. Selecting a material that has a history of performing in similar situations is important and provides a level of comfort. Using materials from a reputable manufacturer with a successful track record will also go a long way in the selection process. There are various rules and regulations that closely regulate the types of materials and their use. The advent of the volatile organic compound (VOC) regulation in Canada has dictated change in the types of solvent-based adhesives and primers being used. (For more on VOCs, see the article, “Understanding Canada’s VOC Regulations,” by Dianne Carey, CSI, CDT, in the July 2012 issue of Construction Canada. Visit www.constructioncanada.net and select “Archives.”) It is essential the designer review these before selection.